Over the holidays, my boyfriend’s family always does a White Elephant gift exchange. If you’re unfamiliar, it’s basically where everybody finds random, unwanted things around their house (sometimes humorous things…) and trades them. I saw this gem and surprisingly (or not surprisingly…) nobody else wanted it! I knew immediately that it would be an awesome game to redo for speech purposes! I feel like I’m ALWAYS looking for new, motivating activities, especially for boys! Spiderman seemed like just the thing! Most of the example pictures shown below are all adapted for gameplay targeting /k/ articulation words, but imagine using the game for pronouns, basic concepts (color, size, etc…) or prepositions! Really anything! It’s so open ended, and easy to reuse! All you’ll need after buying the game is a fine tipped Sharpie and small circle labels! This game is played just like memory! The students should take turns flipping over Spiderman pieces to try and match up what is on the bottom. Instead of using the included Spiderman character stickers, I used blank Avery circle labels that I could customize using speech goals! See below for examples of ways to adapt this game in your speech room! 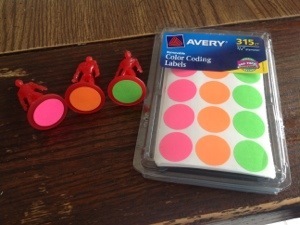 1) You could write individual articulation words on the circle labels. The students could take turns trying to find a match by turning over two. They could read each word they turn over aloud and get many, many trials in that way! 2) Buy multiple colors of the circle labels and color code several index cards. When a child finds a match, they need to read 4 of the words on the corresponding card. For example, if a child flips over two green Spiderman pieces, they would read 4 (or however many) words from the green dotted index card. 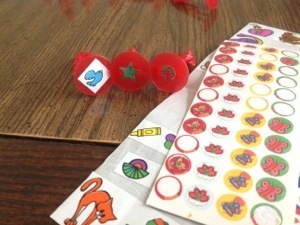 3) Target phonological awareness by writing pairs of rhyming words on the stickers. You could do the same thing for sight words as well! 4) Target vocabulary with small stickers! You could also target shapes this way as well. 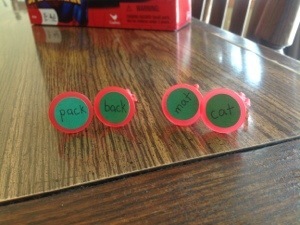 5) Target colors with these labels! I found these at Walmart for only $1. You could also use these for the color coded index cards as shown in number 2. **Note: If you don’t leave the labels on for too long, they should peel off easily if you want to adapt this game for another purpose! I hope to collect multiple sets and keep them in labeled baggies for various goals! I also love how little space this game takes up! You could even throw away the box, and just keep the Spiderman pieces in a ziploc bag next to the cardboard game board! This 76-page product was designed to use in a binder as a portable, complete resource to target basic concepts and listening skills. In order to be used fully as intended, you will need lamination paper, a binder, and a small amount of Velcro. It can be found in my TpT Store here. Thank you!! If you are interested in staying up to date on freebies, giveaways, and new posts, ‘like’ me on Facebook here.